Perhaps the most popular figure of the Buddhist pantheon is the Bodhisattva Guanyin (Avalokitesvara). One of the common depictions of the Bodhisattva during the Song, Yuan and early Ming period was the so-called Water-Moon Guanyin or Avalokitesvara of the Southern Seas, which shows the figure seated in rajalilasana or Royal Ease on a base mimicking a rocky shore of his island home as described in the Gandavyuha, the last chapter of the Avatamsaka-Sutra. As the base and the backing of the present figure are missing it is difficult to know which Guanyin is represented. The Water-Moon Guanyin for example sits usually with a kundika-bottle nearby. 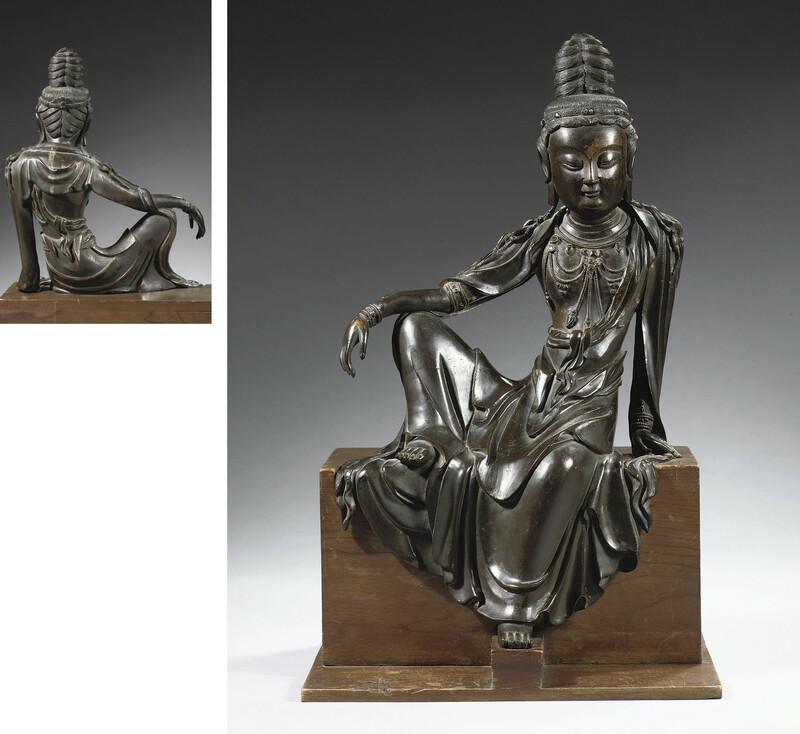 For an example of such a Guanyin in its original setting, close in style to the present lot but much smaller and dated to the Song-period, compare Christie's Fine Chinese Ceramics and Works of Art, New York, 20 March 2001, Lot 62. The present figure shows a variety of features common to 14th century Buddhist bronzes of this kind, particularly in the elongated and slim-waisted, very upright torso, the mannerist style of the long arms cast in dramatic gesture away from the torso, the drapery folds, the shawl worn around the shoulder and the elaborate festoons of jewelled chains. These characteristics can be found on images of Guanyin dated to the late Yuan- early Ming-period, such as the figure from the Oppenheim Collection, now in the British Museum, illustrated by W. Zwalf, ed., Buddhism: Art and Faith, London 1985, no. 298. There it is noted that between the 10th and 14th centuries, it was popular to depict such figures seated in rajalilasana, ibid, p. 207. The Oppenheim Avalokitesvara is illustrated again by Ulrich von Schroeder, Indo Tibetan Bronzes, no. 143D, p. 143, where the figure is referred to as Water-Moon Guanyin. Another figure is in The Asian Art Museum of San Francisco, illustrated in Hai-wa yi-zhen: Chinese Art in Overseas Collections - Buddhist sculpture, National Palace Museum, Taipei, 1990, p. 178, no. 164 and a third figure in the Museum of Eastern Art, Oxford, illustrated in Transactions of the Oriental Ceramic Society, 1959-1960, vol. 32, pl. 102, no. 236. A figure close in style to the present lot is a dry-lacquer Water-Moon Guanyin from the Yuan period in the Ference Hopp Museum of Eastern Asiatic Arts in Budapest, illustrated in Orientations, Vol. 39, no. 3, April 2008, p. 32. As Derek Gillman mentioned it is most likely that this type of rajalilasana was adopted by sculptors from the Hinduist Art of South- and East-India during the 8th and 10th century. After the fall of the Tang-dynasty during the 10th Century, there were probaly Chinese pilgrims who brought Avalokitesvara figures in rajalilasana for the first time from Sri Lanka to China, compare A New Image in Chinese Buddhist Sculpture of the Tenth to Thirteenth Century, Tansactions of the Oriental Ceramic Society, vol. 47 (1982-1983), p. 33-44.